Borghi’s team. 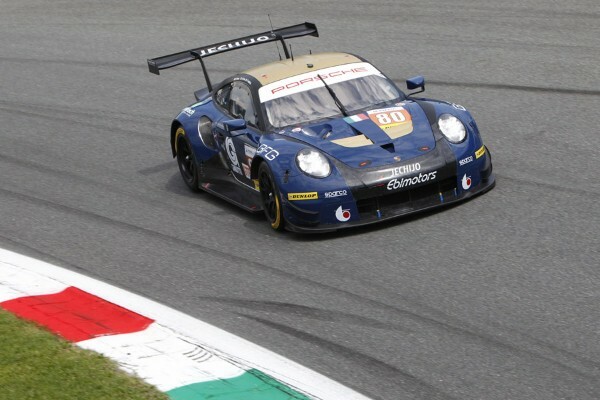 It represented a big responsibility for the Italian-French crew who had to protect their Porsche 911 RSR car in the LMGTE category. Expectations were not disappointed thanks to the marvellous pole position reached by our nineteen-year-old driver, R. Pera (Ebimotors), who imposed his car no. 80 with the best time of 1’47.493 placing before major drivers like G. Bruni (Proton Competiton), M. Lieb (Proton Competition) and M. Molina (JMW Motorsport). The excellent third position by R. Narac (Ebimotors) deserves to be mentioned in the test dedicated to the bronze drivers. the third class position. R. Pera (Ebimotors) tried to recover the lost lap and fifty minutes before the end of the race F. Babini (Ebimotors) took the car from his mate. Our gold driver challenged both M. Dienst (Proton Competition), who was racing at a high speed, and M. Griffin (Spirit of Race), who shoved out. F. Babini (Ebimotors) enabled to end the race on the third LMGTE class position with great effort. This was a race with an expected big number of safety car entries, dramatic turns of events and successful or unsuccessful strategies. The crew Narac-Pera-Babini gained a point on the overall standings reaching the second place both in the driver and team standings. Drivers: 1. Macdowall-Griffin-Molina 37 points; 2. Narac-Pera-Babini 31; 3. 20; 7. Cairoli 19; 8. Lieb 18; 9. Olsen 10; 10. Bruni 10; 11. Castellacci-Flohr 8; 12. Davison-Barker 0. Krohn Racing 20; 7. 54 Spirit Of Race 8; 8. 86 Gulf Racing 0.